Today, a church member took myself, Val and LeaAnne to lunch. She warned us ahead of time that we might be a little concerned when we saw the place, but that they had great food. She was right on both counts. 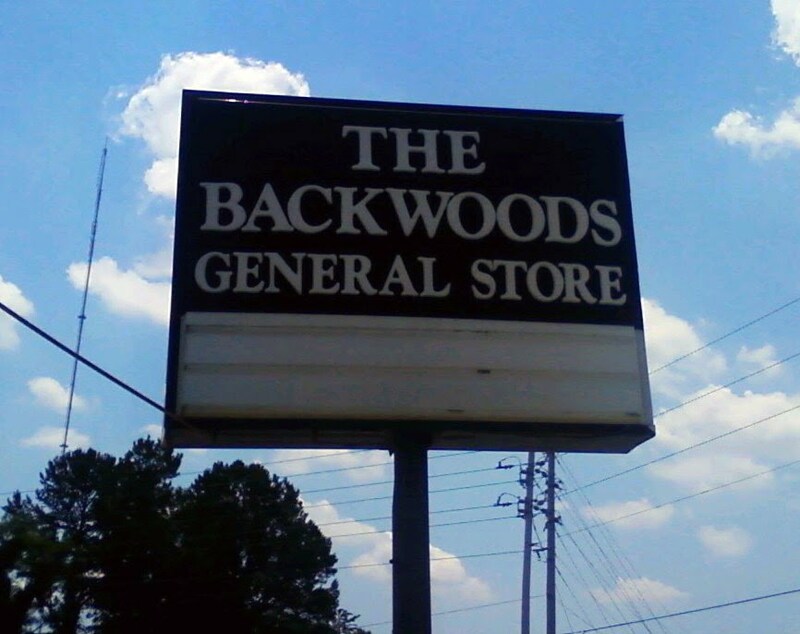 Here's how you get to the aptly named Backwoods General Store: get to the middle of nowhere in north Gaston County, then keep driving. Outside, you see this sign and a somewhat worse for the wear building with a bright orange door. Inside are 6 tables, so I'm told--I only saw 3; they're all ensconced in a labyrinth of antique furniture, books, toys, games, pictures and all sorts of odds and ends, including birdhouses, baskets, boxes and more made of or decorated with wine corks. If I'd had the time to poke around, you probably wouldn't have seen me for several hours, as I'd be bound to get lost in exploring the place and its contents. Oh, and the food. My goodness. Talk about a square meal, and I'm talking classy yet inexpensive. I ordered the smothered chicken--incredibly tender, juicy chicken covered with tomatoes, roasted red peppers, bacon, mushrooms and cheese--with a side of fresh fruit and roasted broccoli (which had cheese and spices of some sort on top, and was delicious). All that came with a roll and a drink. The chef doesn't have a dishwasher, so everything is served on paper plates, and in lieu of drinks in cups, your options are bottled water or canned soda. Everything was wonderful, and I was sorely tempted to try dessert but restrained myself. It may be out of the way, but Backwoods is getting attention--I was told that at night there's a line out the front door to eat there, and you can check out this article in the Gaston Gazette for a review. The plan, apparently, is for them to relocate to Gastonia in order to be more accessible not only to the faithful clients who trek out there regularly but also to the not-yet-enlightened who will surely benefit from exposure to the food. What an experience.